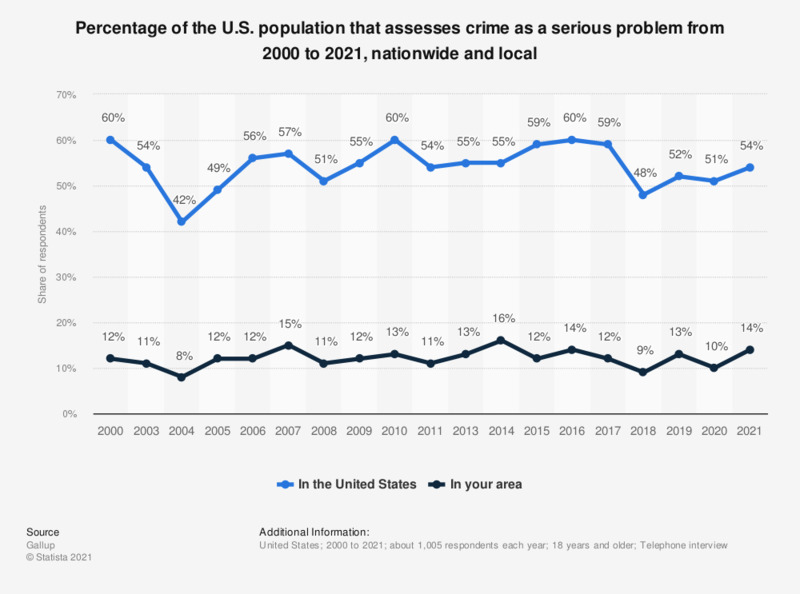 The statistic shows the percentage of the U.S. population that assesses crime as a serious problem from 2000 to 2018, on a nationwide and local scale. The most recent survey was done in October 2018. In 2018, about 48 percent of the respondents said crime was a serious or extremely serious problem in the United States, but only nine percent felt their area had a serious problem with crime. The statistic above only shows the Top-Two boxes "extremely serious" and "very serious". During the survey, this question was posed as follows: "Overall, how would you describe the problem of crime in the United States/in the area where you live -- is it extremely serious, very serious, moderately serious, not too serious, or not serious at all?"